Podemos mistook their local committees (the celebrated circulos), along with the municipalist initiatives, for mere generators of demands, not places for collective construction and political creativity. Español. "Come close to me, come closer. I promise it will be beautiful." Municipalism is nothing other than thousands of neighbours coming together in a joint effort to build a new model for their city. 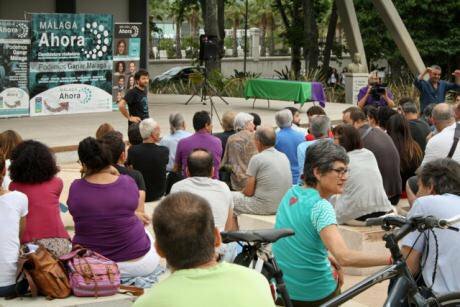 In the summer of 2014 a set of initiatives necessary for staging a so-called institutional assault were already appearing in several Spanish cities: the municipalist movements. These departed from existing common grounds in their desire to overcome the two-party system, end with corruption, and democratise the local councils. The strategy to be followed was that of creating candidates’ lists of convergence for the local elections in which common people, as opposed to representatives of parties and other types of social, cultural or political organisations, could finally take part. Following the eruption of the 15M movement in spring of 2011, a period of rupture with 'the 1978 regime' had already begun. Municipalism is the very expression of this rupture at the local level, if we consider that democracy begins fundamentally with proximity. Only a few months before the municipalist hypothesis began to shape up, however, the Spanish political scenario had already been shaken by the creation and rise of a new political force: Podemos. As passions ran high, serious, in-depth reflection remained nonetheless scarce. Podemos’ first error, which municipalism tried to attenuate with a friendly and sympathetic view, was its explicit self-proclamation as the only possible actor in the landscape capable of the political transformation of Spain. Assembly meeting, Málaga Ahora, Málaga. Photo supplied by author.Podemos stands to fail dramatically in the coming general election if the convergence with other actors is limited to drawing up pacts for taking over office. Without the collective support of an individual activist base, it will only be the sum of what has existed before, which is far from enough to succeed. Podemos’ other errors included understanding their local committees (the celebrated circulos), along with the municipalist initiatives, as mere generators of demands and not as places for its collective construction and political creativity. We understand this as an unreflective self-limitation of the authentic generative power of a willing crowd. This is a clear short-circuit for the mobilisation capacity that Podemos was able to amass in the beginning when it was nourished by its ‘círculos’ (and not the centralist National Citizens’ Council). Paradoxically, Podemos builds on visions of change, but also sets out its own limitations.Paradoxically, Podemos builds on visions of change, but also sets out its own limitations. From the beginning, Podemos was a breath of fresh air in terms of political participation on a scale that had never been seen before in other major parties. However, the fraught relationship it established with its grass roots structures has by now become a paradigmatic case, as has the jealousy of its main figures. Its open primary elections for the 2014 European Election were in effect a story of rags-to-riches, supported by more than 33,000 voters. The process ratified Pablo Iglesias as the ringleader of the new, transformational project. Once the leadership was consolidated, however, in subsequent primary elections the methodology changed and pitted a handpicked list against regular activists and members (due to the National Citizens Council’s thirst for ideological homogenisation). The leadership justified these moves as the lesser evil, explained by the necessity of having a well-greased war machinery (the so-called Government of the Best), sufficiently equipped to demolish the walls of the bipartisan system. The arrogance of building a campaign discourse without taking into account territorial peculiarities led to several widely discussed failures. Podemos declined to go to the local elections and gave way to a policy of shy support for the municipalist initiatives and lists. The unexpected success of grassroots-based lists in some of Spain’s major cities at the Local Elections set the ground for newer efforts to emulate the processes of confluence in the anticipated Catalan elections in late September 2015. However, this only happened on paper; unambitious pacts for taking over office ended up being signed to form a coalition with ICV (Green and Communist coalition) and other traditional forces which more closely resembled old politics than following the path of the municipal assault on institutions. After a campaign strongly marked by the Catalan independence dilemma, the results were humble and did not surpass the thirteen seats the ICV coalition won back in 2012. The winners of the elections were the anti-independentist liberals, Ciudadanos, which rocketed from 9 to 25 seats, and the left independentists CUP (going up from 3 to 10 seats) due to their less straightjacketed discourse and tradition of grassroots organisation. Risking going back to the void of representation at the general elections, some of the stronger municipalist nodes of the movements, such as the Galician Mareas and Barcelona en Comú, put themselves forward and decided to support common lists for the upper and lower representative chambers while, at the same time, asking their parliamentary groups to support Iglesias’ campaign to become President of the government. En Comú-Podem (In Common-We Can) or En Marea-Podemos (In a Tide-We Can) will be found on ballots in Galicia and Catalonia on Election Day. This is an unprecedented formula in Spanish politics. Only time will tell. As we are in the middle of campaigning and approaching Election Day, it is still too early to make predictions. Certainly Pablo Iglesias and his team created a political media device that caused a stir in various sectors of the society. Podemos led to thousands of previously unconvinced citizens believing that the winds of change were finally blowing. It is also true that, from a social movements’ perspective, a series of reflections on the effectiveness of a hypothetic conjunction between these movements and this emergent political force have begun to be articulated, an important analysis, considering that societies in southern Europe as a whole are undergoing key democratic transformations. Things have changed, however, rather quickly. In effect, we can now imagine real possibilities for a complex process of composition-recomposition unfolding after the December 20 general elections. We can now imagine real possibilities for a complex process of composition-recomposition unfolding after the December 20 general elections. Depending on elements still to be revealed, Podemos could be dragged towards more rigid group dynamics, internally, and begin to embrace identitarian political logics. In positive terms, nevertheless, it is fair also to note Podemos’ successful redefinition of certain terms that have burdened politics for decades. It is also remarkable that the party was funded without the financial support and militant strength of the local ‘circulos’. We understand that there are many identities in Podemos. In the city of Málaga, for instance, many of our colleagues, aside from participating in Podemos, offer all their knowhow and experience to our local municipalist node, Málaga Ahora. They have joined this initiative not for the interests of the party, but with a sense of trust in persons coming from different backgrounds. This experience of confluence has taught us many things and, if we have learned from it, Podemos is also able to do so. From this perspective, citizens’ candidates lists have proven that, if we want a turnaround in the political orientation, we will first need a radical change of methods, embracing distributed leadership, flexible and commonwealth-focused organisational structures, horizontal decision-making, on-going listening and collective participation. All of these methods were, however, left behind in Podemos’ élan to create a hegemonic machine and its obsession with developing a catch-all centrality of discourse. Nevertheless, Spain is just a mere ‘province’ of Europe. If having representation in our local councils has taught us one thing, it is that there are huge institutional limitations to our strategies for change. From one day to the next, the different municipalist lists had to invent the basic requirements for building an organisational structure able to overcome the party-form and generate the required power to create a real countervailing power against establishment lists. In the same vein, Podemos’ (original) radically democratic DNA could not develop without social movements able to maintain their autonomy in relation to the power of the party. Municipalism remains nonetheless an emergent phenomenon, that has already started to show signs of weakness. Yet, for all its limitations, in contrast with Podemos, municipalism is much more aware of its own limitations. Finally, we cannot forget that change needs to surpass the larger scales; social change begins much closer to home: in our towns and cities. Nevertheless, Spain is just a mere ‘province’ of Europe. In order to stage a much-promised assault to the skies, we will need to undergo a process of transition from the specific to the general. Yet, the concepts of ‘state, nation or homeland’ have already entered into the official discourse of Podemos. And here we have it again, another limitation.